THE KEZBEZ WEIGH SUPER SOMOOTHIES ARE HERE! Introducing Kerry’s Chocolate Orange Super Smoothie. Your new favourite fast food fix just got better! As always, the ingredients have been selected for their great taste and health benefits. Each smoothie is homemade, has plenty of vitamins, minerals & fibre, healthy fats, complex carbohydrates and an easily digested source of protein. Oranges are a sweet and juicy citrus fruit. An excellent source of vitamins C, A, and B. They contain the minerals, potassium and calcium; are a source of dietary fibre; and contain phytochemicals - which are antioxidants found in plants that are considered beneficial to health. Raw Cacao powder is the super food of super foods. It contains nearly four times the antioxidant content of regular dark chocolate and twenty times more than blueberries. It has over 700 compounds and complex antioxidants (polyphenols), which help reduce LDL (bad) cholesterol and prevent hardening of the arteries. Cacao contains phenethylamine. This is a mood enhancing compound, which triggers the release of endorphins. Cacao has also been shown to reduce appetite, making it a naturally occurring appetite suppressor. Another amazing ingredient is cayenne pepper. It brings a little heat to the smoothie but that’s not all. Cayenne pepper dilates the blood vessels (vasodilation), and speeds up metabolism due to the high amounts of capsaicin. This vasodilation increases circulation and blood flow, which facilitates oxygen and nutrient delivery to all the major organs; aids fat burning (oxidation), thus can help when on a weight management programme, and can also help to regulate high blood pressure, promote healthy liver function and regulate the digestive system. Avocado is added to provide a healthy fat and give the smoothie a rich creamy taste and texture. An excellent source of dietary fibre and mono-unsaturated fatty acids, that can help lower LDL (bad) cholesterol and increase HDL (good) cholesterol. This effect on cholesterol an help prevent coronary artery disease as well as reducing the risk of having a stroke. On a micronutrient level, avocados are rich in vitamins B, K, C, and E, and a rich source of potassium, which helps to regulate fluid balance within the body’s cells. Whey protein powder is an easily digested form of protein. Proteins are an essential macronutrient and are required for many functions within the body. Being “essential” basically means that the body cannot make these compounds. We have to get them from external food sources, making it an invaluable ingredient in my smoothies. Proteins are the main component of body tissue, our organs, hair and skin. Amino acids (building blocks of proteins) are used as co-enzymes; for hormone production; involved in the immune response; needed for cellular repair and for the formation of red blood cells. You can be forgiven if you just thought protein was needed to build muscle. It is, and it does but we need it to maintain life, basically! Next to water, proteins are the next prolific molecules within our body. 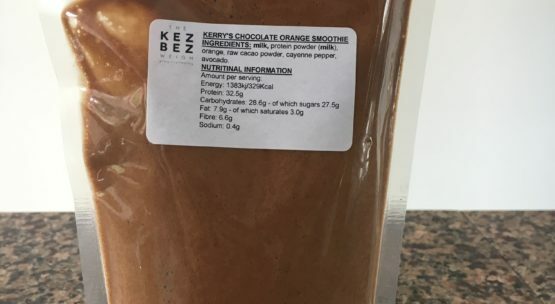 Each Kerry’s Chocolate Orange Smoothie will give you 329Kcals, 32.5g of protein, 28.6g of carbohydrates, 7.9g of fat and 6.6g of fibre. If you have a sweet tooth but don’t want to ruin all your efforts in the gym, grab a pouch of Kerry’s Chocolate Orange. If you like a fruity vibe, try the Tropical Smoothie. If you like your fruit to pack a punch, then choose the Peach Punch. All of these can be found in the new storage freezer at Elemental Kickboxing Academy. So there you have it. Three different smoothie flavours, all super in their own way. In summary, the KezBez Weigh Super Smoothies help to make good food choices easy.